The medicinal chemistry of antibacterial drugs is, like many fields of the subject, a rapidly evolving subject – not least because of the ever-present rise of resistance. Here, we take a quick but comprehensive glance at some of the main classes and what structural features elicit their antibacterial properties. Antibacterial drugs are compounds that are able to kill (bactericidal) or inhibit the growth of bacteria (bacteriostatic). Antibacterial drugs may be synthetic, semi-synthetic, or naturally occurring and tend to be small molecules. The term antibiotic is used when referring specifically to antibacterial agents that are acquired from natural sources such as other bacteria, fungi, and plants. As the name suggests, the sulfonamide (or sulphonamide) class of antibacterials contain a sulfonamide group. Sulfonamides are synthetic antibacterial agents and are sometimes referred to as sulfa drugs. Prontosil is a red dye that was found to possess antibacterial properties against certain bacteria duringin vivo studies. The compound itself is not the active antibacterial agent. Individuals working at the Pasteur Institute in Paris discovered that prontosil is metabolised to sulfanilamide, meaning prontosil is by definition a prodrug. 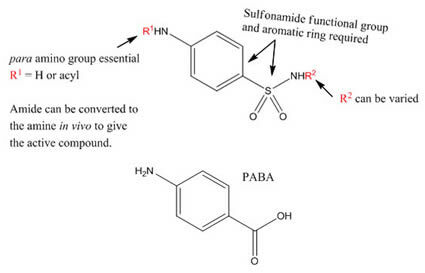 Sulfonamide antibacterials serve as competitive inhibitors of the enzyme dihydropteroate synthetase (DHPS). para-Aminobenzoic acid (PABA) is the natural substrate of the enzyme. Given the structure of PABA and the generic structure of the sulfonamide antibacterials, can you suggest possible intermolecular interactions established between DHPS and the molecules that bind to it? DHPS is involved in folate synthesis and is not expressed by most eukaryotic organisms including humans. Sulfonamides are therefore bacteriostatic antimetabolites. The patient’s immune system fights the invading microorganism as the drug inhibits growth. Since sulfonamides collaborate with the immune system, they are not recommended for individuals that have a weakened immune system. Examples of sulfonamide antibacterials are shown below (sulfadiazine, sulfadimethoxine, and sulfamethoxazole). Sulfonamide antibacterials can treat a wide range of bacterial infections. However, they prove ineffective against infections such as Salmonella. Problems associated with sulfa drug use include allergic reactions, photosensitivity, nausea, and diarrhoea. Due to these problems, β-lactam antibiotics are more popular. The tetracycline antibacterials are polycyclic broad-spectrum antibiotics synthesised by the Streptomyces genus of bacteria or semi-synthetic derivatives of such compounds. With a few exceptions such as pseudomonas aeruginosa, tetracyclines have bacteriostatic activity for most Gram-positive and Gram-negative bacteria, both aerobic and anaerobic. In Gram-negative bacteria, tetracyclines traverse the outer membrane by passive diffusion through beta barrel proteins present in the outer membrane of Gram-negative bacteria. These beta barrel proteins are known as porins. Macrolide are bacteriostatic antibacterials that contain a macrocyclic lactone ring typically made up of 12 or more atoms. Macrolides typically contain two or more characteristic sugars attached to the macrocyle. 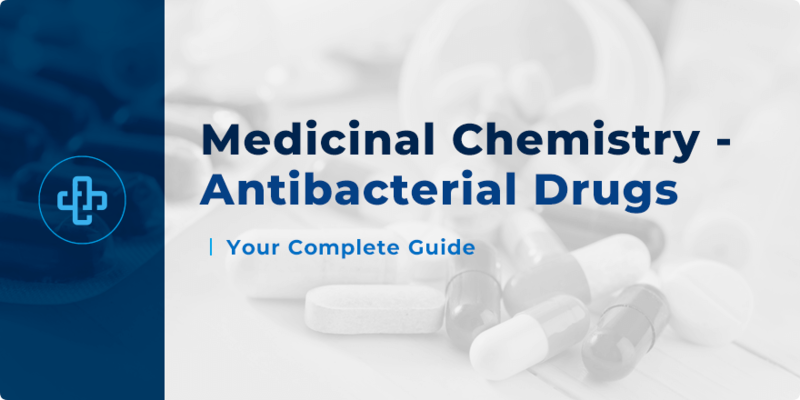 Macrolide antibacterials are generally used to treat Gram-positive infections. Macrolides also exhibit activity against mycobacteria, neisseria and legionella pneumophila. Erythromycin is one of the most well-known macrolides. 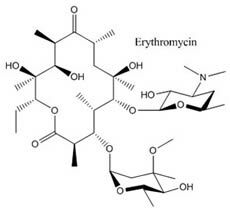 Streptomyces erythreus is the soil microorganism where erythromycin was first isolated.Erythromycin’s mode of action is currently not fully understood. However, it is known that the compound binds to the 50S subunit of ribosomes. Erythromycin contains a cladinose is the sugar glycosidically attached to C3. 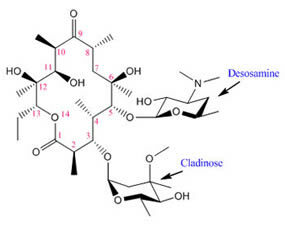 Desosamine is the amino-sugar glycosidically attached to C5. The tertiary amine group of the desosamine amino-sugar grants the compound a basic character, opening the possibility of forming acid salts.Ester prodrugs of erythromycin include stearate, ethyl succinate, and propionate esters. Erythromycin is sensitive to acidic conditions such as those in the stomach. Under acidic conditions, an intramolecular ketal formation reaction involving the hydroxyl groups at C6 and C12 and the C9 carbonyl group may occur. Clarithromycin is a semi-synthetic derivative of erythromycin. The C6 hydroxyl group is replaced by a methoxy group in clarithromycin. Such modification granted the compound increased acid-stability while retaining antibacterial activity. Clarithromycin appears to exhibit greater potency against mycoplasma pneumoniae and legionella. Azithromycin is a semisynthetic derivative of erythromycin which contains a 15-membered lactone ring. A key named reaction in the preparation of azithromycin is the Beckmann rearrangement reaction. Like clarithromycin, azithromycin also has enhanced acid-stability. The molecule also has enhanced lipid solubility and drug half-life. Azithromycin is also generally more active against Gram-negative bacteria. The oxazolidinones are protein synthesis inhibitors, targeting an early step of bacterial protein synthesis. These bacteriostatic synthetic antibacterial agents are used against highly resistant gram-positive bacteria, generally as a last resort treatment. Linezolid, ranbezolid, and tedizolid are examples of oxazolidinones. Linezolid is active against streptococci, vancomycin-resistant enterococci (VRE), and notably methicillin-resistant Staphylococcus aureus (MRSA). Tedizolid received FDA approval on June 2014. This compound is used to treat infections of the skin caused by Gram-positive bacteria, particularly ones that are highly resistant to other treatments. Am. J. Health. Syst. Pharm. 2014, 71(8), pp 621-633. Quinolones are bacteriostatic synthetic antibacterial agents primarily used for urinary tract infections in humans.Most quinolones in clinical use are fluoroquinolones, meaning they contain a fluorine atom attached to the central bicyclic system, typically at C6 or C7. Quinolones and fluoroquinolones act by stabilising the DNA-topoisomerase complex formed during replication and transcription. 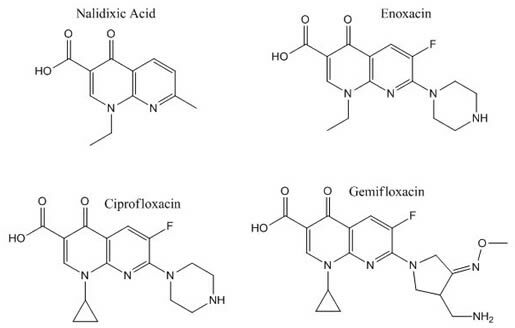 Fluoroquinolones have activity against legionella pneumophila and mycoplasma pneumoniae.The compound, nalidixic acid was discovered to possess antibacterial activity during the 1960s. Since the discovery of this property, many synthetic quinolone antibioticsthat are analogues of nalidixic acid were developed. A few decades later, a breakthrough was made with the development of the fluoroquinolone, enoxacin. This compound has enhanced spectrum of activity. It was also discovered that substitution with fluorine enhanced bacterial uptake. Basic substituents such as the piperazinyl ring in enoxacin appear to enhance the drug’s pharmacokinetic properties. Ciprofloxacin is an enoxacin derivative with a cyclopropane ring. Currently quinolones are divided into four generations based on antibacterial spectrum. Gemifloxacin is an example of a 4th generation quinolone. Ansamycin antibacterials are a family of compounds that show activity against many Gram-positive and a few Gram-negative bacteria. The rifamycins and streptovaricins are subclasses of this family. Only the rifamycins will be discussed. In 1957, rifamycins were first isolated from a fermentation culture of streptomyces mediterranei. Rifamycin B was the only component of the mixture that was isolated successfully in pure form. Further studies eventually led to the development of the semi-synthetic derivative of rifampicin (or rifampin). Rifampicin exists as a zwitterion. Key structural features of rifampicin include a macrocyclic group, a flat naphthalene ring, several hydroxyls, and a piperazine moiety. The naphthalene ring and the hydroxyls are found to be essential for activity. Rifampicin is rather stable in water and is very stable in dimethyl sulfoxide (DMSO). This compound acts by binding non-covalently to bacterial DNA-dependent RNA polymerase. A peptide chain not present in mammalian RNA polymerase but is present in the bacterial enzyme is thought to be the reason for the selective property of rifampicin. In combination with other drugs, rifampicin is used to treat infections of mycobacterium infections (i.e. tuberculosis and leprosy), listeria, legionella, neisseria, as well as MRSA. Pseudomonas species have intrinsic resistance to this drug. As the name suggests, the nitrofuran antimicrobials contain a furan ring and a nitro group. Examples of compounds belonging to this class include furazolidone, and nitrofurantoin. Furazolidone is believed to be involved in the inducement of DNA cross-links. Bacterial DNA is susceptible to this drug compared to human DNA.Nitrofurantoin is bactericidal and is used in the treatment of most gram-positive and some gram-negative urinary tract pathogens. The bactericidal mechanism of nitrofurantoin is currently not fully understood. Lincomycin, the first isolated lincosamide antibiotic, was isolated in 1962 from a soil microorganism called streptomyces lincolnensis found near Lincoln, Nebraska. Efforts to improve the pharmacological properties of lincomycin led to the development of the 7-chloro-7-deoxy derivative, clindamycin.In terms of mechanism of action and spectrum of activity, the lincosamides and the macrolides are similar. The lincosamides interfere with bacterial protein synthesis and depending on various factors may be bacteriostatic or bactericidal. The lincosamides are generally active against many Gram-positive bacteria, particularly the cocci. They also exhibit activity against non–spore-forming anaerobes, mycoplasma, and actinomyces.Interestingly, lincomycin also exhibits activity against certain plasmodium parasites. The glycopeptide antibiotics act by inhibiting the synthesis of bacterial cell wall.Glycopeptide antibacterials are made up of glycosylated cyclic or polycyclic nonribosomal peptides. 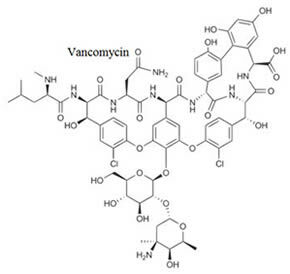 Vancomycin is one of the most well-known glycopeptides in clinical use. This antibiotic was first isolated from soil actinobacteria. Vancomycin is used to treat serious infections caused by Gram-positive with known or suspected resistance to other antibacterials. Intestinal infection of clostridium difficile may be treated as well by vancomycin. With the exception of neisseria, vancomycin is known to be inactive against Gram-negative bacteria. Streptomycin, gentamicin, and neomycin are examples of aminoglycoside antibacterials. These broad-spectrum antibiotics are able to interfere with bacterial protein synthesis. Aminoglycosides antibacterials contain glycosidically-linked aminosugars. Aminoglycosides generally share a common feature of poor absorption following oral administration. These compounds are used to treat systemic infections. Ototoxic and nephrotoxic effects associated with aminoglycoside use restricted systemic use for serious infections. The β-Lactam antibiotics will not be discussed here. This includes the penicillins, cephalosporins, monobactams, and carbapenems. A separate article will discuss these classes of antibacterials.